The 4th part of Circular Interpolation Concepts & Programming series explains how cnc program for an arc can be made if arc Radius (R) is not directly given. I – relates to the address X and is the incremental value and direction (+/-) from the start point of the arc in the X axis to the arc centre. J – relates to the address Y and is the incremental value and direction (+/-) from the start point of the arc in the Y axis to the arc centre. In this figure the procedure is very clear to calculate I and J values. 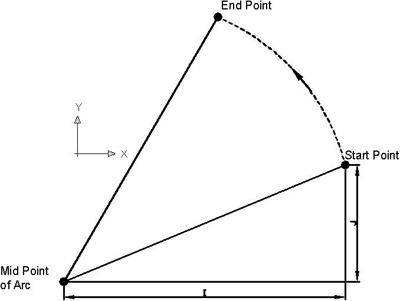 From the point where arc is started always look to wards arc midpoint. If the arc is less than a quadrant than you must find out the both I and J values.